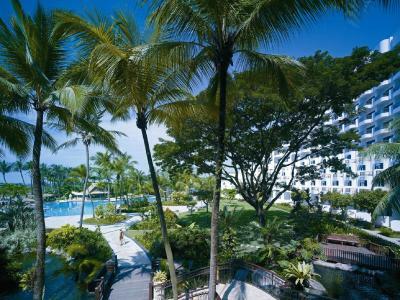 Lock in a great price for Shangri-La's Rasa Sentosa Resort & Spa – rated 8.7 by recent guests! We keep coming back because of the location and amenities. The connecting rooms are best for our family with 3 children. We can have our own privacy but just a door away from our kids where we can watch over them and know that they are safe. Hotel food is also good. 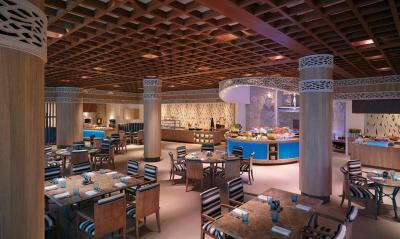 The buffet breakfast is the best spread with a wide range of selection. Many thanks to Mr Prakash from concierge for being professional and friendly. Great housekeeping service. 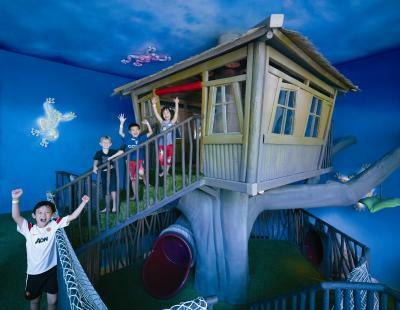 family friendly hotel , many activities for kids , amazing location close to sentosa attractions , helpful staff , tasty food and nice breakfast buffet . 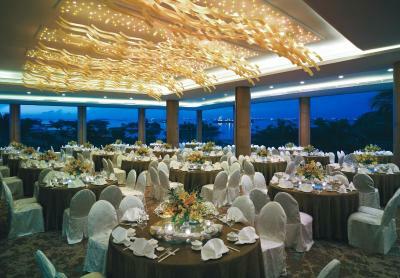 every thing is amazing in Shangri-la hotel. staff friendly and helpful. great location, clean room. 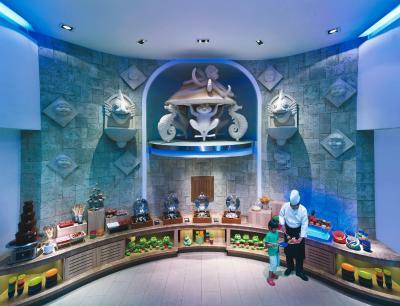 The complimentary kids club alone makes this an incredible value. The kids facilities inside and outside were top notch and appealing to a wide range of ages. Its also open late (9pm!) which allows for babysitterless adult dinners. Very impressed with attentiveness of kids program staff ---they even scan kids for fever before check in . There are free laundry machines available to guests & other nice unexpected conveniences. We called security bc a taxi driver choose to idle and smoke cigs on the road below our balcony for an extended time one morning. It was quickly resolved and the manager followed up personally a few minutes later to offer us an upgraded room for the rest of our stay. Talk about above and beyond! 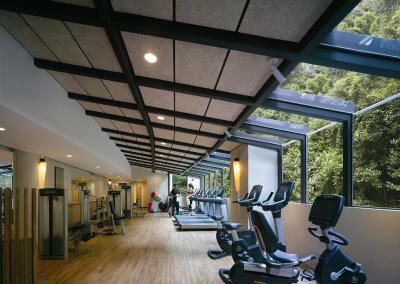 The architecture apply incorporates the natural surroundings. Truly lovely. We loved the wild animals on the grounds. Saw monkeys and a family of peacocks! 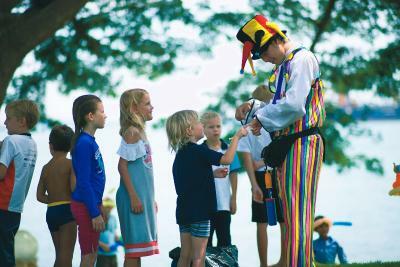 The property is clean and have alot of activities for kids and adults. The service was great and the people are all accomodating. All the staffs are excellent. It’s a very friendly place for family with kids. Convenient transportation to Resort world Sentosa as the bus station is just 2 mins walk away. The hotel shuttle bus to Vivo city is also convenient. Breakfast is excellent with various choices. My family would definitely come again! 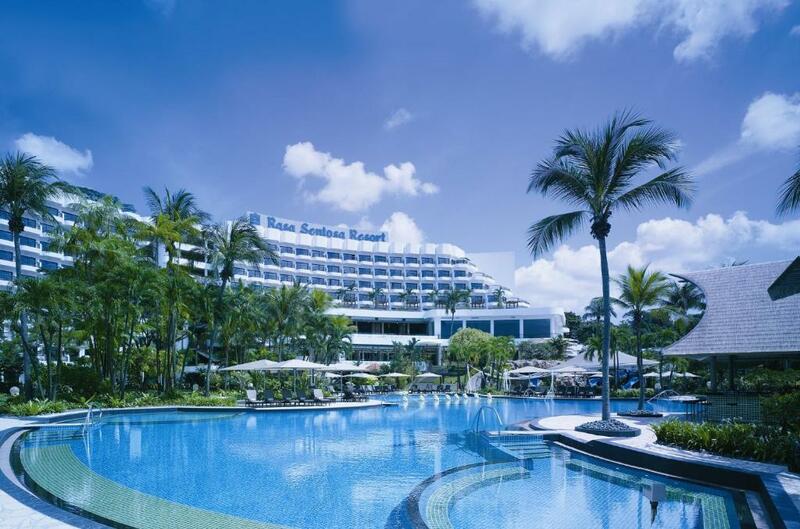 Shangri-La's Rasa Sentosa Resort & Spa This rating is a reflection of how the property compares to the industry standard when it comes to price, facilities and services available. It's based on a self-evaluation by the property. Use this rating to help choose your stay! 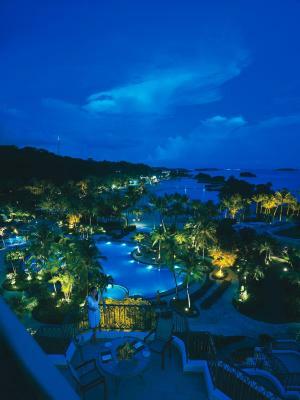 One of our top picks in Singapore.With panoramic views of the South China Sea, Shangri-La's Rasa Sentosa Resort & Spa offers a modern tropical holiday experience along Siloso Beach. It features an outdoor swimming pool and guests can enjoy meals from 3 in-house dining options or have a drink at the bar. Free WiFi is available throughout the property. It is 0.8 mi to Madame Tussauds Singapore, while Adventure Cove, S.E.A Aquarium and Universal Studios Singapore are within 1.6 mi away. VivoCity Shopping Mall is 2.7 mi from the property, with a monorail service directly linked to Sentosa. Complimentary shuttle services to and from VivoCity shopping mall is available. Alternatively, the property provides complimentary Sentosa monorail passes for guests during their stay. 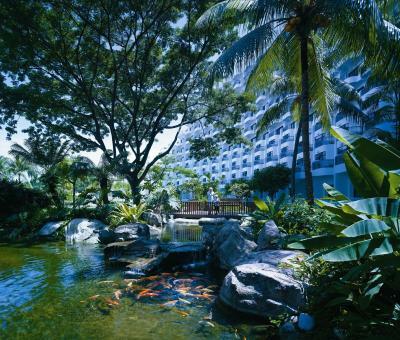 Changi Airport Singapore is 17 mi from Shangri-La's Rasa Sentosa Resort & Spa. Each guestroom comes with a private balcony overlooking views of the hill, sea or landscaped gardens. The private bathroom includes shower facilities, a hairdryer and free toiletries. Guests enjoy a complimentary round of items from the mini-bar. Guests can approach the 24-hour front desk for currency exchange, tour arrangements, concierge services and luggage storage. Other facilities include a fitness center, children’s water slides and splash pad. Water sports equipment are available for rent for adventure-seekers. Also available at the resort is The Toots Club, offering babysitting services. 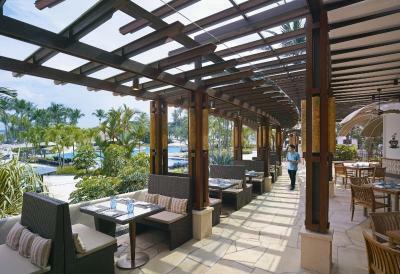 The in-house restaurant features a three-in-one dining concept that includes an all-day buffet. 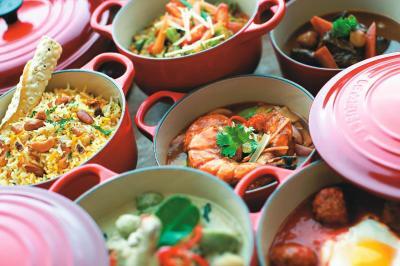 8 Noodles serves up authentic Chinese cuisine while Casserole offers an international spread. Trapizza features a selection of Italian fare. 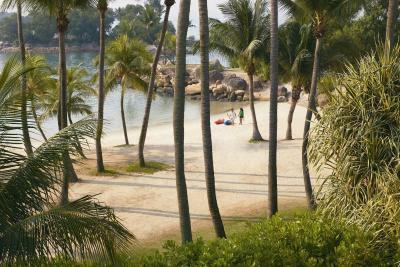 Sentosa Island is a great choice for travelers interested in Universal Studios, cleanliness and food. 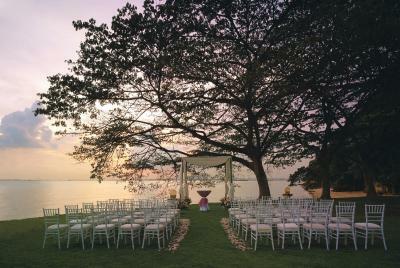 When would you like to stay at Shangri-La's Rasa Sentosa Resort & Spa? This air-conditioned double room features a private balcony that opens up to views of the sea. It is fitted with a flat-screen TV, mini-bar and a desk. The open-concept bathroom includes a separate shower, a hairdryer and free toiletries. Please note that additional beds and baby cots are not available for this room type. Children are not allowed in this room category. This air-conditioned superior double room features a private balcony that opens up to views of the hill. It is fitted with a flat-screen TV, mini-bar and a desk. The private bathroom includes a separate shower, a hairdryer and free toiletries. 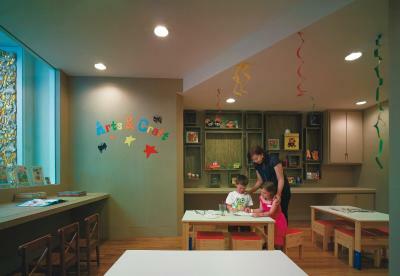 Room can accommodate up to 3 adults or 2 adults and 1 child. Please note that an extra bed is subject to availability upon request. This air-conditioned superior twin room features a private balcony that opens up to views of the hill. It is fitted with a flat-screen TV, mini-bar and a desk. The private bathroom includes a separate shower, a hairdryer and free toiletries. This air-conditioned deluxe double room features a private balcony that opens up to views of the South China Sea. It is fitted with a flat-screen TV, mini-bar and a desk. The private bathroom includes a separate shower, a hairdryer and free toiletries. This air-conditioned deluxe twin room features a private balcony that opens up to views of the South China Sea. It is fitted with a flat-screen TV, mini-bar and a desk. The private bathroom includes a separate shower, a hairdryer and free toiletries. This air-conditioned twin room features a private balcony that opens up to views of the sea. It is fitted with a flat-screen TV, mini-bar and a desk. The open-concept bathroom includes a separate shower, a hairdryer and free toiletries. This air-conditioned deluxe double room features a private balcony that opens up to views of the swimming pool. It is fitted with a flat-screen TV, mini-bar and a desk. The private bathroom includes a separate shower, a hairdryer and free toiletries. Located on the ground floor, this air-conditioned deluxe double room offers direct access to the swimming pool. It features a private balcony that opens up to views of the garden. It is fitted with a flat-screen TV, mini-bar and a desk. The private bathroom includes a separate shower, a hairdryer and free toiletries. This air-conditioned deluxe twin room features a private balcony that opens up to views of the swimming pool. It is fitted with a flat-screen TV, mini-bar and a desk. The private bathroom includes a separate shower, a hairdryer and free toiletries. Located on the ground floor, this air-conditioned deluxe twin room offers direct access to the swimming pool. It features a private balcony that opens up to views of the garden. It is fitted with a flat-screen TV, mini-bar and a desk. The private bathroom includes a separate shower, a hairdryer and free toiletries. This larger air-conditioned deluxe suite opens up to views of the sea. It is fitted with a flat-screen TV, mini-bar and a desk. The private bathroom includes a separate shower, a hairdryer and free toiletries. This air-conditioned double room features a private terrace that opens up to views of the swimming pool. It is fitted with a flat-screen TV, mini-bar and a desk. The private bathroom includes a separate shower, a hairdryer and free toiletries. This air-conditioned double room features a private terrace that opens up to views of the sea. It is fitted with a flat-screen TV, mini-bar and a desk. The private bathroom includes a separate shower, a hairdryer and free toiletries. 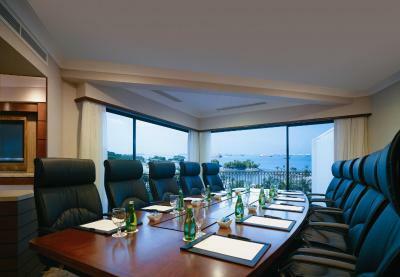 This spacious air-conditioned suite is fitted with a flat-screen TV, mini-bar and a desk. The private bathroom includes a separate shower, a hairdryer and free toiletries. 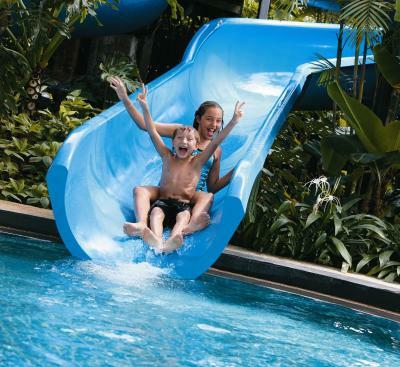 Shangri-La’s Rasa Sentosa Resort & Spa has been named best in Asia and among the top 20 in the world in TripAdvisor Travellers' Choice Award for Best Family Resort. Area Info – This neighborhood is a great choice for travelers interested in Universal Studios, cleanliness and food – Check location Great location - show map Guests loved walking around the neighborhood! 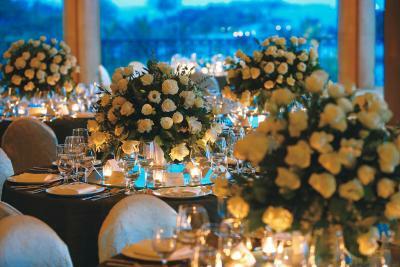 House Rules Shangri-La's Rasa Sentosa Resort & Spa takes special requests – add in the next step! Shangri-La&#39;s Rasa Sentosa Resort &amp; Spa accepts these cards and reserves the right to temporarily hold an amount prior to arrival. Shangri-La's Rasa Sentosa Resort & Spa accepts these cards and reserves the right to temporarily hold an amount prior to arrival. 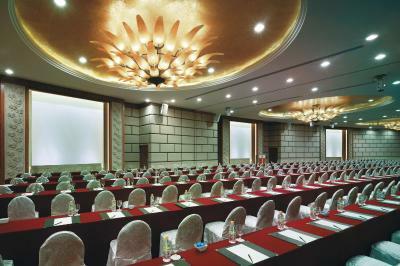 the photo looks bigger the room compare the actual room size, a bit disappointed. A bit disappointed with the mechanics of their golden circle membership. Our panoramic sea view room was smaller than expected. The resort is definitely better suited to families than child free visitors. The sun loungers were all very close together and not enough of them had an umbrella. The bed was a bit hard for our taste but after another layer of doona it was good. Children being allowed in the adults section of the pool area. They did not inform us through booking.com that a prior deposit of 800 dollars will be charged at the check in. Big concern about the aggressive monkeys that wouldn't allow us to spend time in the balcony or keep the balcony door open. Every morning we had to wait in the queue to be seated for breakfast and sometimes it was quite a long wait. Poor service at the pool and the spa and quite shocked by some unfriendly staff members. Not good value for money. The only issue that there was a bad smell coming out from the bathroom, but I only mentioned it to the hotel at the checkout. So I can't blame them for not taking action on it. Evening was excellent, really amazing. Location facilities, beaches, activities, staff, you name it. they prepared a spacious extra bed. Poor food, room service inedible, too noisy. Not in the same class as most Shangri La Hotels. The variety of food at the restaurants was less than expected. The kids outdoor swimming pool with slides were fantastic, the fun team made days at the pool enjoyable.